Aquatic therapy is an effective rehabilitation tool for patients recovering from a wide variety of surgeries and injuries that benefit from the buoyancy and warmth of the water. The buoyancy of the water reduces the effects of gravity and facilitates mobility while minimizing pain. Our stone pools provide a soothing spa-like atmosphere for our aquatic therapy patients. The pool is heated to a comfortable 93° and is equipped with an underwater treadmill and bicycle for those seeking a more challenging aquatic therapy. Who Benefits from Aquatic Therapy at BreakThrough Physical Therapy? 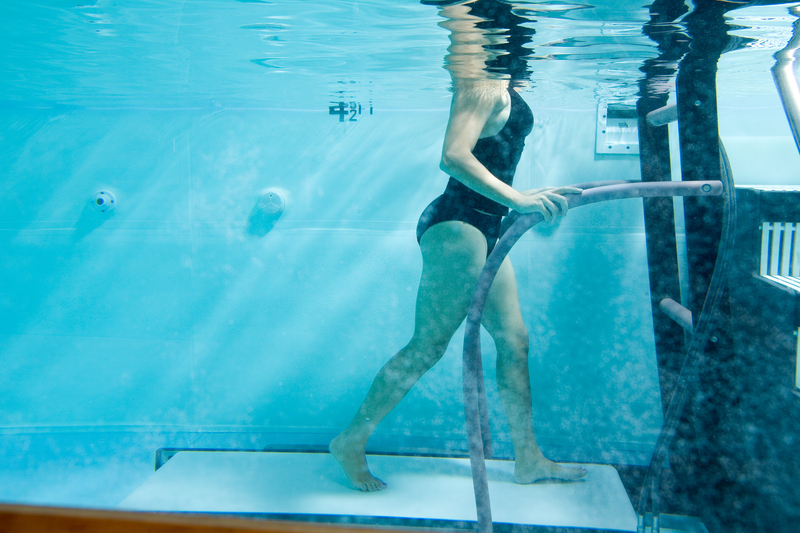 BreakThrough Physical Therapy offers aquatic therapy at our Cary, Greensboro- Yanceyville, and Winston-Salem clinics. Conditioning sessions require a therapist evaluation and exercise program prescription before starting the pool program. Patients that do not require assistance or supervision may purchase a Monthly Pool Membership. Please call the clinic that is most convenient for you for pricing and package options.